AIA Triangle and NC Modernist Houses tour-goers discovered Raleigh Architecture Co.’s innovative urban infill houses in an old neighborhood. “Hungry Neck,” an old, established neighborhood just east of Downtown Raleigh, is not an expected destination for homes tours. A mixed-use neighborhood, most of the houses there were built between 1900 and 1940 and many of those are in disrepair. However, two recent homes tours – the Triangle section of the American Institute of Architects’ (AIA Triangle) Residential Tour on October 11th and North Carolina Modernist Houses’ (NCMH) annual “ModaPalooza Tour” of strictly Modernist houses on October 17 – brought hundreds of surprised participants to the 500 block of East Edenton Street. 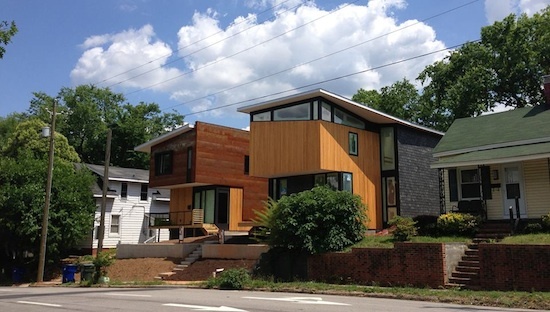 There they discovered two Modernist urban-infill houses designed and built by Craig Kerins, AIA, and Robby Johnston, AIA, of the Raleigh Architecture Company (RACo). At 554 and 556 East Edenton Street, these houses are actually two of five RACo-designed Modernist houses that will soon grace the Hungry Neck neighborhood within a block of each other. One across the street, the Hungry Neck house at 562 New Bern Avenue, is under construction. (The NCMH group got a sneak-peak inside.) Next door to the Hungry Neck house, the Floyd house at 558 New Bern is just a foundation at the moment, as is the fifth project, the Powers house at 567 New Bern. Johnston and Kerins also live in or near the downtown district. In fact, 554 Edenton is Johnston’s private residence, which he shares with his wife and two young daughters. Nabarun Dasgupta and Roxanne Saucier own the house next door with son Ishan. Johnston calls the two completed houses on the recent tours “paternal twins.” Architecturally, they share certain similarities, he explained, including North Carolina cypress siding, window style, thin shed roofs, and a narrow footprint – yet maintain individual identities through variations in form and materials. They also share a green space/courtyard since the compact lots didn’t allow for individual side yards, as well as upper-level outdoor spaces: Johnston’s 1800-square-foot house features a second-floor terrace while the 2100-square-foot Dasgupta-Saucier house features a third-story terrace. The houses differ in additional exterior materials. Gray slate from a demolished house in nearby Historic Brooklyn neighborhood became siding for 554 Edenton. The Corten steel that wraps around 556’s upper level is transforming from a raw steel finish to a uniform, intentional patina as it acclimates to is downtown Raleigh surroundings. Since Kerins and Johnston knew they were introducing Modernist, sustainable residential design to this old urban neighborhood, they made a concerted effort to recall architectural elements from the existing structures. Front porches, created and shaded by cantilevered upper forms, “pay tribute to the importance of ‘public’ outdoor space in these and all historic Southern homes,” Kerins noted. The houses address the sidewalk at the same distance as neighboring houses and floor-to-ceiling windows on the lower levels engage the neighborhood while high windows on the upper levels provide privacy for the personal spaces there. To ensure an abundance of natural light in these slim houses, RACo designed open floor plans for both with double-height cores capped by large skylights. RACo fabricated open steel staircases in each to accommodate vertical circulation. At 556 Edenton, the staircase is a bold element within the space. The NCMH “ModaPalooze” group also visited RACo’s renovation of the Larry Wheeler-Don Doskey house in Chapel Hill. You are currently viewing the archives for October, 2014 at THE RACo JOURNAL.